Kevin Rose has told TechRadar about his scariest moment as founder of Digg – the day when the site's community would not take no for an answer over publishing the HD DVD crack. 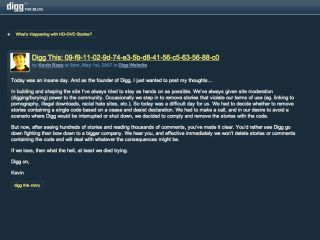 The so-called HD DVD 'revolt' saw users go to great lengths to publicise the code on Digg after the original item was taken down, with founder Rose caving in to his audience's demands and posting a now famous blog concluding: "If we lose, then what the hell, at least we died trying." TechRadar caught up with Rose at the Future of Web Applications conference in London, and he admitted that it was a worrying time, although the potential repercussions failed to materialise. "I was on a plane to LA and I took off kind of just as the HD DVD thing was starting to explode," explained Rose, who also discussed politics and the future of Digg. "When I landed I took my cellphone off flight mode and it was 'ding, ding, ding' and I had about 15 text messages. "I'm like 'this can't be good'. They all said that the entire front page was filled with stories digging the HD DVD code and said 'call us right away'. "That was definitely my scariest day at Digg. I don't know, it must have been extremely scary and a little eye opening for the attorneys that serve the cease and desist orders as well. "I think they thought they could erase this string of 16 characters that from the internet." "We had people recording the code to music, putting it on YouTube and saying 'you can't take this down it's just a song. "That was my favourite; that and the people who took the digits and converted them into Klingon!"